Dr. Abelson’s Blogs are on a wide variety of subjects from soft tissue injuries, to sports performance to his own personal opinions. Motion Specific Release (MSR) is a hands-on evidence-based technique that recognizes the strength of merging diverse perspectives and methodologies to achieve optimum results. We now use MSR procedures everyday in our daily clinical practice to achieve incredible results. Motion Specific Release has evolved from a constant desire to improve our clinical outcomes and to help our patients get back to the fully functional life they want to lead. MSR is used to successfully treat a wide variety of musculoskeletal conditions-from head to toe. MSR is not your typical passive technique where the practitioner provides therapy, while the patient sits back and does nothing. MSR requires active participation of the patient in both therapy and during execution of prescribed exercises. It has been over 25 years since I first started practicing as a musculoskeletal practitioner (MSK Practitioner). My entire career has been a constant process of education and evolution. After eight years of post-secondary education, I thought I knew quite a bit about the human body and how to help people, but in reality my knowledge base was very limit‐ ed, and my education was just beginning. Throughout my career I have been extremely fortunate to work with, and teach, alongside some great practitioners from a wide variety of health care disciplines in the MSK world. I have worked with amazing chiropractors, physiotherapists, medical practitioners, osteopaths, acupuncturists, myofascial release practitioners, registered massage therapist, kinesiologists, coaches, Olympic level and professional athletes, and some incredible personal trainers. Working with, and teaching, with these individuals has taught me many great lessons. These life lessons have helped me to develop the Motion Specific Re‐ lease (MSR) procedures, and the courses that we are now offering to other medical professionals. I think it's important to give you a few of my perspectives about these lessons so you can understand the basis of this incredible technique. My career has taught me that we all need to be grateful for those who preceded us. Every MSK technique that is now available today is built off of the work of others. In other words “we are all standing on the shoulders of giants” a phrase that is attributed to Bernard of Chartres who used to compare us to dwarfs perched on the shoulders of giants. He pointed out that we see more and farther than our predecessors, not because we have keener vision or greater height, but because we are lifted up and borne aloft on their gigantic stature. MSR procedures would never have been developed without the great teachers I have had, the research that has been done, or the numerous clinical experiences of those who preceded me. Therefore, I Thank my colleagues and teachers for the knowledge and truths of these various perspectives. After working with so many different types of professionals, I quickly learned that the best solutions usually come by merging a diversity of perspectives. No singular therapeutic modality, profession, or philosophy has all the answers. (I have also learned that anyone who thinks they have the ultimate solution for a given problem is usually deceiving them‐ selves at the expense of the patient.) There is always a better way to provide care. We may not immediately see the solution, but by going through a logical process of investigation and treatment, it is often possible to achieve a complete resolution of most conditions. Integration of multiple methods and perspectives is one of the fundamental precepts of Motion Specific Release (MSR). Just because somebody says "there is no solution" to a particular problem does not mean that a solution does not exist. Solutions to problems often require a process of exploration. This does not require us to give up standard orthopedic and neurological tests, or the incredible advances that modern medicine has provided. It does mean that when we do not achieve the results we are looking for, we should start considering alternative methods. For example, the work I have done in Fascial Manipulation (Stecco’s Fascial courses in Italy and Anatomy Trains) has taught me how incredibly important kinetic chain relation‐ ships are. At Kinetic Health, we have often achieved a complete resolution of difficult conditions by treating areas of the body that are not normally considered. Another example is how Traditional Chinese Medicine has taught me to step outside the normal paradigms of Western Medicine to look for viable solutions along the body's energetic pathways. You often have to be creative to achieve great results . In other words, you have to "think outside the box". Sometimes we literally have to create a new procedure or exercise based on an individual's specific needs. This creative process is one of the real powers of Motion Specific Release (MSR). By being able to adapt both the procedures we have created (or other techniques) we are able to meet the specific needs of each individual. Unfortunately, most treatment methodologies are like cookbooks. Some people love the recipes, while others hate them. The same holds true for treatment methods. What works well for one person may not do so well for the next. Every person is an individual and must be treated as such. A dozen patients may be diagnosed with the same condition, yet the underlying cause of the problem may be completely different for each person. Even the anatomical structures involved can vary greatly. These many variations are the primary reasons why so many people who suffer from chronic musculoskeletal conditions never achieve a full resolution with generic treatments. Motion Specific Release is a technique that embraces creativity. Creativity is the ability to transcend traditional ideas, patterns, relationships; it allows you to create meaningful new ideas, methods, interpretations, and techniques. What some more information about Motion Specific Release go to https://www.yumpu.com/kiosk/motionspecificrelease. The human body is an incredible, living, adaptive, self-communicating, always evolving machine that surpasses even our most advanced technological wonders. Unfortunately, this is not how standard anatomy classes are taught. With in the medical educational system we are taught more about separate parts rather than totally integrated systems. Essentially we tend to compartmentalize everything as if they were somehow not part of a complete system. Essentially our education system "Dumbs Down" the human body to make it easier to teach students. 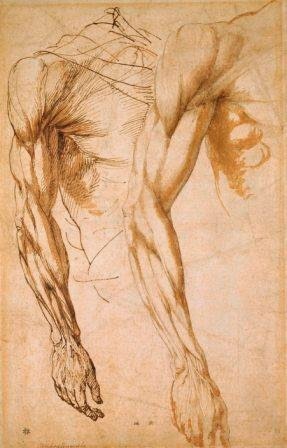 (Drawing of the upper extremity by Michelangelo). My specialization is the treatment of musculoskeletal conditions. Over 20 years ago when I first began my practice, I also looked at the body from this very limited perspective. Fortunately for my patients, my perspective has changed radically. You could say that three fundamental areas of knowledge have given me a personal epiphany on how our entire body works as one synergetic interconnected system. These are the myofascial system, the body's kinetic web, and the concept of tensegrity. The prefix 'Myo’' refers to muscle, whereas ‘fascia’ refers to the connective tissue that permeates the entire human body. Fascia is everywhere in the body, weaving through, and connecting every component of the body. 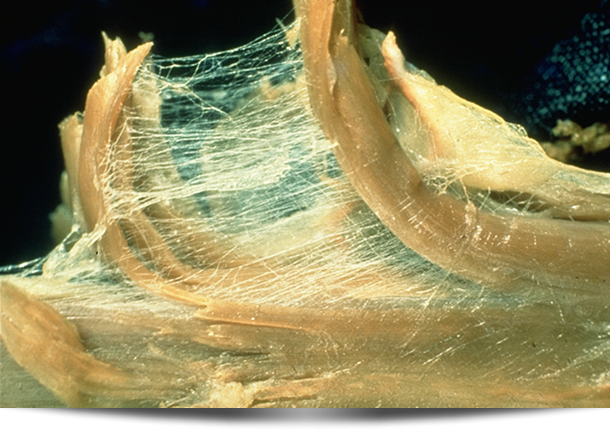 Fascia forms a seamless web of connective tissue, which connects, holds, and infuses the tendons, organs, muscles, tissues, and skeletal structures. To get a better understanding of how interconnected we really are, it is essential that we first understand the significance of fascia. New discoveries over the last few decades have shown that fascia plays a very important role beyond that of simply serving as a packing material around muscles and organs. Fascia is intimately involved in controlling both the movement patterns and the neurological control mechanisms of the entire body. It is an integral component of a body-wide signalling system. Interestingly, it has been shown that fascia is full of neurological receptors (even more so than muscle tissue). This is rather astounding, especially when of realizes that most physicians do not consider how fascia plays such a key role. Consider the image to the right, this is a dissection of the elbow (proximal lateral elbow region). What makes this dissection unique is that the muscles are dissected away from the body instead of the fascia. 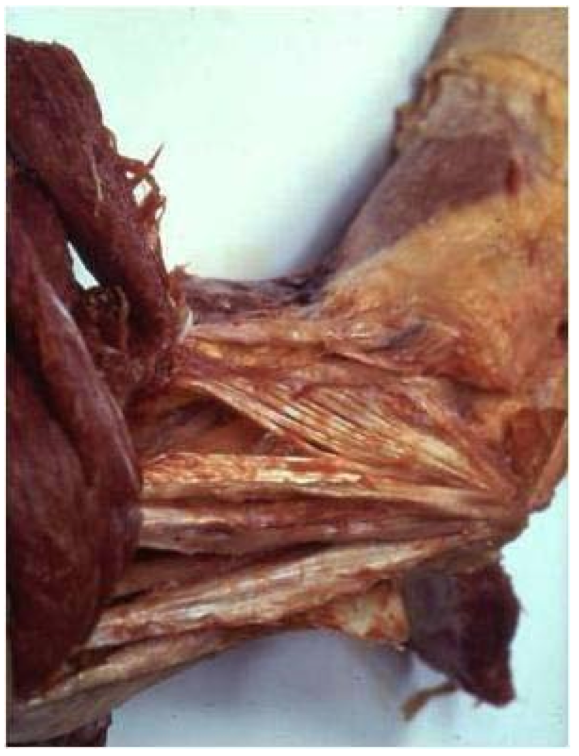 The strands you see show the convergence of this connective tissue to link all the structures surrounding the lateral elbow (lateral epicondlye). This is a great example of how convergence of multiple strands of connective tissue can form a interconnected functional matrix. If we did the same type of dissection technique in other areas of the body (shoulders, hips, knees etc.) we would discover a very similar pattern. Multiple stands of connective tissue, in complete continuity, with no visible separation from each other. Text book anatomy looks nothing like this. The anatomist's scalpel has removed all the fascia leaving the impression of individual muscles, all by themselves, each performing their own separate actions. 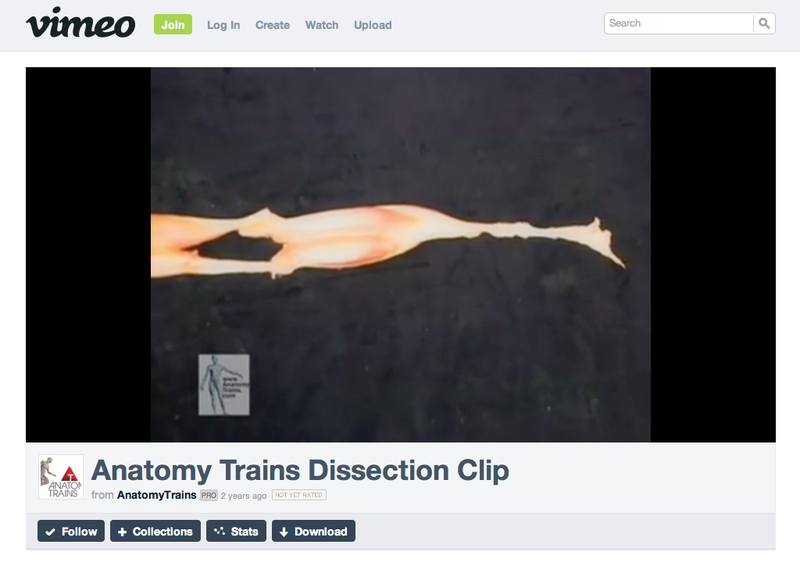 Standard anatomy is actaully an anatomical fantasy, and a rather dumbed-down one at that! Standard texts for anatomy and biomechanics teach us that motion is created by the contraction of muscles. These muscles have tendons at each end that insert directly into bone. When a muscle contracts, the two ends of the muscle (origin and insertion) are pulled towards each other to create motion. Although this description is quite true, it is also a reductionist perspective about what is really happening in the body. Let me explain how an understanding of fascia can help us develop a new, more holistic perspective about how the body performs its actions. This will give us a better understanding about why looking at the bigger anatomical picture can help us to better resolve many complex musculoskeletal conditions. First, consider the fact that the muscle fibers actually originate from, and insert into, both the surrounding fascial fibers as well as the bone. These fascial fibers, in turn, insert into multiple regions of other bones, and even into other adjacent muscles. These additional points of contact provide muscles the ability to generate force in multiple directions (a three-dimensional model of movement). Learning about these multiple points of fascial attachment – all working across three-dimensions – completely changed my understanding of the biomechanics of muscle action, and also provides me with a much more functional understanding of muscle contraction. Now, when I look at, and analyze muscle contraction, I realize that only certain sections of the muscle contract to perform an action (not the entire muscle). In actuality, groups of muscles usually work together as functional units to execute any action. For example, some muscles may act as the primary movers (agonists) to perform an action, while other muscles act as antagonists; while yet others act as synergists and others as stabilizers. In all these activities fascia is the key component that allows these muscles to work together as functional units by aiding in coordinating their actions across multiple joints. Depending on the degree of motion, and the amount of force that is needed, each muscle will then contract very specific areas of the muscle, rather than the entire muscle. These very specific motions are largely coordinated by the neurological receptors embedded in the fascia, and are not controlled by the brain alone. Your body is made up of a remarkable series of kinetically linked systems which, when working efficiently, store and release impressive amounts of energy without injury! Essentially, each body acts as a single large three-dimensional Kinetic Web, in which force or tension from one area directly affects multiple structures in both localized areas, and structures far from the site of tension. The Kinetic Web can be thought of as a linked series of kinetic chains. Each kinetic chain is made up of individual links (the various components of your musculoskeletal system, nervous system, and cardiovascular system) which are connected to each other to form a three-dimensional Kinetic Web. When you have changes in one area of your body, there will be cascading effects throughout the entire body, and thus multiple structures in your kinetic web will be affected. Any weak link in this chain not only generates its own set of problems, but also creates problems and compensations somewhere else in the body. For example, when a structure in your hip, groin, or pelvis is injured or restricted, it becomes unable to effectively perform its normal functions such as walking, climbing up stairs, or even being intimate with your significant other. Kinetic Lines (whole body fascial interconnections) are actual physical structures that have been mapped out and dissected. These are actual physical structures that connect our bodies together. Researchers and clinicians such as Thomas Myers (Anatomy Trains), Luigi, Carla and Antonio Stecco (Fascial Manipulation) have spent decades researching these interconnections. Other researches have mapped out slightly different connections, but the general concepts remain very similar. For example let us consider the Superficial Back Line (SBL). Click image to view a video of the dissection of the Superficial Back Line (SBL). As you view this video, consider how the fascia on the bottom of the foot connects directly into the calf muscles, hamstrings, low back, into the neck, and even to the top of the head. In fact, they are all inter-connected and inter-dependant. A key concept in understanding your body as an interconnected kinetic web is known as ‘Tensegrity’. Tensegrity is a structural principle that describes the integrity of a structure based on the balance of tensional forces rather than just its compressive nature. First a little history; the term 'Tensegrity' was made popular in the 1960’s by a neo-futuristic architect by the name of Richard Buckminister “Bucky” Fuller (1895-1983). Fuller came up with this term when examining the highly creative sculptures of Kenneth Snelson. Snelson’s sculptural works are composed of both flexible and rigid components. Snelson uses the term ‘floating compression’ instead of ‘tensegrity’ to describe his sculptures. The geodesic dome is a superb example of an architectural structure that uses the concepts of tensegrity. Due to its structure, the geodesic dome is an incredibly stable building due to all the pressure being distributed throughout the entire framework. I remember my sense of awe and wonder when I saw my first geodesic dome as a child at the 1967 World's Fair in Montreal (The Biosphere). Even then, I and many other, knew that we were looking at something special! With regards to how tensegrity relates to the human body, I will refer to an analogy used by Thomas Myers of Anatomy Trains. Standard anatomical perspectives teach that our skeleton provides a strong stable framework to support the array of soft tissue structures that are attach to it. This is a concept of ‘continuous compression’ in which the osseous structure of the body provides structural integrity. This is the same concept we use when building skyscrapers, where each layer of the building provides support for the next layer, and is built on a strong base of stability (a Linear Model). The problem when applying this concept to our human body is that this is a static model (not reality). Yes “continuous compression” works well in building construction, but not so well in explaining the structural integrity of dynamic human bodies that are in continual motion. Think about this, without the muscles, ligaments, tendons, and connective tissue, the framework (our skeleton) would simply collapse. Thomas Meyers uses the analogy of a sailboat to describe this concept. He compares the mast of the boat to our skeletal system and its rigging to our myofascial system. When the wind catches the sail of a boat it directs an incredible force into the mast, yet the mast does not come toppling down because of the tensional balance of its rigging. When one side of the rigging becomes tight and contracted, while the rigging on the other side of the boat becomes loose and movable. That is, until the wind changes and the sail is then pushing in another direction which requires the line of tension to shift to the other side. This describes a dynamic system where a rigid structure (the mast) can take on dynamic qualities because of it tensional system (its rigging). In the same way, our skeletal system maintains its integrity due to the balance of tensional forces provided by our myofascial system. We can run, jump, move, take our bodies into a thousand contorted positions, and return to a state of balance all because of this concept of tensegrity. The greatest thing about understanding how our body is totally connected is the how this information helps resolve even some of the most chronic injuries. Consider this analogy. 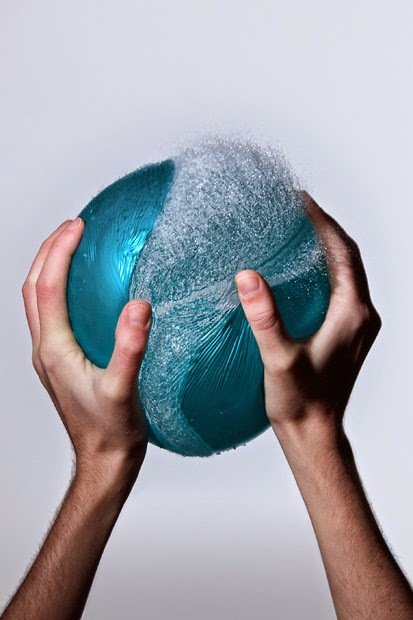 Consider how a soft pliable ball reacts to compressive forces. An interesting thing occurs when we take a ball that is about seven inches in diameter (like the ones we use for myofascial release of the abdomen), and compress it with our hands. When we grasp the ball and squeeze hard, the area that we are squeezing contracts while the rest of the ball expands. If we then take some type of mechanical device and squeeze even harder until the ball bursts, we would find the area of rupture in the ball is the weakest part of the material. Interestingly, the point of rupture is often located far from the point of applied force. The same thing occurs in the human body. Previous injuries, muscle imbalances, lack of exercise, mental stress (anxiety), poor nutrition, and a host of other problems all create weak links in your body’s kinetic chain. These are areas where the body is most susceptible to injury. When increased stress is applied to the body, the entire body tries to compensate. If the weakest link cannot withstand this additional stress, then an injury occurs at that link. This tells us that we not only have to consider where the body has developed weak links, but we also have to consider the non-symptomatic areas that are creating this increased stress. Often, these are areas where the patient is not even aware that there is any problem. Tensegrity is the key to resolving most chronic musculoskeletal injuries. We must “Look local and Look global”. If there is a problem, we must address both local and global areas. Treatments that only address the symptomatic region (the area of pain) are really an equation for failure. Bottom line, we are so much more than what appears on the two dimensional pages of an anatomy text (the dumbed-down version). We are complex three-dimensional beings that work as one synergistic organism. Recognizing this gives us the path to true healing, ignoring this leads us down the path to ongoing dysfunction. Do you want more information about this, and other topics. Our books (e-Books and hard-copy) provide more information about soft-tissue injuries, rehabilitative exercises for injury recovery, and how to apply these tools to activate and restore all the structures of your kinetic chain. To purchase our internationally best-selling books, visit www.releaseyourbody.com. For information about our clinic in Calgary, Alberta, please go to www.kinetichealth.ca. Or call us at 403-241-3772. Iliotibial Band Syndrome (ITBS) is an overuse injury seen in runners, cyclists, soccer players, skiers, and weightlifters. ITBS is one of the most common causes of lateral knee pain. This condition often never completely resolves with conventional treatments, since most practitioners do not typically address all of the key structures involved in this injury. Traditionally ITBS is seen as a friction syndrome in which the iliotibial band rubs against the lower portion of the leg (lateral femoral epicondyle of the femur). It has been postulated that this occurs when the iliotibial band moves anterior and posterior during knee flexion and extension. This repetitive motion causes friction, micro-tears, and inflammation of the area. (including a bursa located between the lateral epicondyle and the IT band). Numerous researchers have demonstrated that the most intense pain is experience at about 30 degrees of knee flexion (a zone of impingement). This is certainly the perspective I was taught during my orthopedic classes 25 years ago. It is also the logic that most practitioners use to formulate a treatment strategy. The only problem is that this perspective is WRONG…. With recent research, this traditional perspective has definitely come into question. This is primarily due to the discovery of anatomical factors that actually prevent the iliotibial band from moving in an anterior-posterior direction. Research has demonstrated that the iliotibial band is actually firmly anchored to the leg (linea aspera of the femur) by a sheet of strong connective tissue (intermuscular septum). In addition it is also attached by strong fibrous strands just above the knee (lateral epicondyle) and deep into the bone. These strong attachments prevent the iliotibial band from sliding anterior and posteriorly over the lower leg (lateral epicondyle) as was previously assumed. Anatomically, the iliotibial band (ITB) is a thickening of a structure known as the fascia lata. The fascia lata is a web of connective tissue (fascia) that completely covers your entire leg. Think of the fascia lata as a sock encasing your entire thigh. The iliotibial band (the fascial thickening) is located on the lateral aspect of your thighand is not an independent structure; it is a fully integrated part of the fascia lata. Which makes the postulated anterior-posterior motion pretty much impossible since it cannot glide independently. The Iliotibial band is also part of a structure called the “Pelvic Deltoid Complex”. In this complex, the superficial layers of the gluteus maximus muscle from the posterior hip and the fibers from tensor fascia lata muscle at the front of the hip fuse into the Iliotibial band. These muscles collaborate with each other to raise the hip to the side (abduct the hip). They also assist the gluteus medius muscle (an abductor) in maintaining the pelvis in a neutral position when standing on one leg (Stance Phase of Gait). In addition the IT band acts as a brace that decreases bending stresses on the leg (femur). It does this by converting tensile loading to compressive loading on the lateral aspect of the leg. When the muscles of the hip become weak, there is an increase in the inward motion (adduction) of the leg. This becomes evident during the Stance Phase of Gait. This inward motion increases the amount of force directed through the iliotibial band, which in turn causes compression of the tissue of the lateral knee. This is exactly what researchers have found in individuals who suffer from ITBS. ITBS sufferers have weak gluteal muscles (abductors) and an increase in inward motion (adduction) of the hip during the Stance Phase of Gait. Earlier, we mentioned that the conventional perspective believed compression of the bursa is the cause of the pain. (A bursa is a fluid filled sac found between anatomical structures). Unfortunately MRI studies have shown that there is no bursa between the IT band and the lateral knee. From a biomechanical perspective, there are no bursa in this area because there is no need for one. Without the presumed anterior-posterior motion, there is no need for reduced friction. However is in the area between the IT band and lateral knee (the site of pain), there is a layer of highly innervated fat, a layer of fat full of neurological receptors. Compression of this area is the most likely cause of the lateral knee pain in Iliotibial Band Syndrome. This new information has completely changed our approach for treating ITBS. Using this new approach we have obtained excellent results in even the most stubborn cases. If you would more information, or to book an appointment to have this condition (or another musculoskeletal condition) treated, just give us a call. 403-241-3772.